Chart via Needham & Co. The fact that the Mac outpaced the overall PC market last quarter is not surprising— Apple has seen its share of the worldwide PC market grow from 2.1 percent in 2005 to 5.5 percent in 2013, Needham & Co. analyst Charlie Wolf noted on Monday. But in the March quarter, Mac sales actually underperformed in established markets. 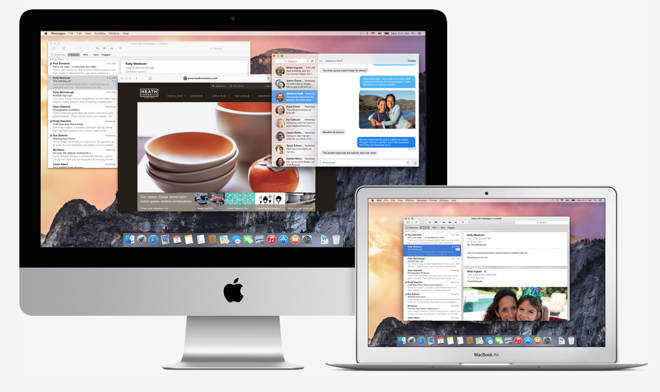 Year-over-year growth for Mac sales was down in North America, according to data from Gartner. 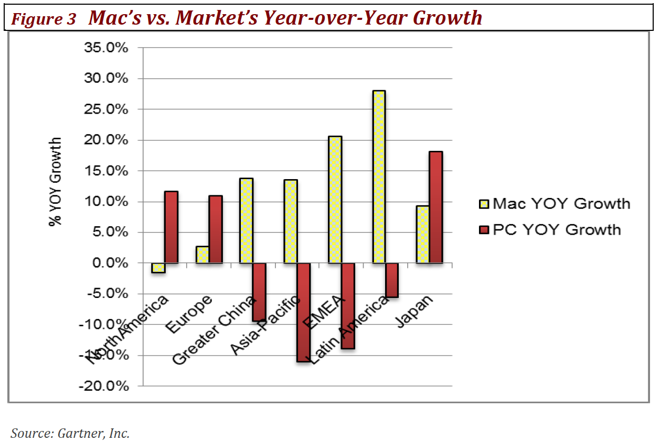 In addition, PC sales growth exceeded the Mac in Europe and Japan. But Apple's Mac platform saw explosive growth in Greater China, Asia Pacific, EMEA (Europe, the Middle East and Africa), and Latin America. In particular, Apple saw explosive growth north of 20 percent in EMEA, and exceeded 25 percent year-over-year growth in Latin America. Wolf, who summarized the data in a note to investors that was provided to AppleInsider, is baffled by this result. "We can see no obvious explanation for the disparity between developed and developing regions," he said. "It could be a one-quarter blip, which only the data for June will reveal. Or it could represent an inflection point in the Mac's fortunes. Only time will tell." Apple's growth in emerging markets comes in spite of the fact that the average selling price of a new Mac has remained well above $1,000, placing the devices in a class —and price range —beyond the low-margin nature of the rest of the PC business. Market watchers believe the continuing decline in PC sales is attributable to the rise of touchscreen tablets, particularly Apple's iPad and iPad mini, which compete at lower price points. But it's also worth noting that Apple recently began experimenting with much lower pricing on its Mac lineup thus far in 2014. Notably, a lack of new next-generation chips from Intel has helped push Apple to focus on more affordable options with its latest Mac models. In addition to the new $1,099 iMac that launched in June, Apple also slashed $100 off its suggested pricing for new MacBook Airs that debuted in April to a new entry price of $899, making them the most affordable mass-market notebooks the company has ever sold. Resellers have undercut those prices even further, likely with the blessing of Apple, which does not itself offer regular discounts or promotional pricing. Steep discounts went into effect on the new MacBook Air and iMac models almost immediately, most notably pushing the entry-level iMac down from $1,099 to just $979 in sales late last month. Those discounts, however, didn't take effect until Apple began launching its new 2014 Mac models in April, after the March quarter data from Gartner. That means that any results from sales and discounts in the just-concluded June quarter will not be revealed until the company's fiscal third quarter earnings call next Tuesday. In the meantime, Apple's strong March quarter performance in emerging markets remains "counterintuitive," Wolf admitted.